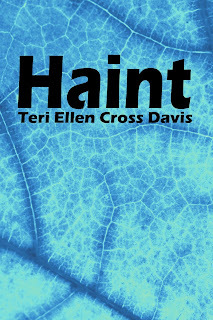 “Haint by Teri Cross Davis opens with a poem, Fade to Black, that creates a map of the body, puts a lens to a life: ‘Only now can pixels completely capture/ the mulatto ancestors...‘. I am reminded of the power of the body as Ta- Nehisi Coates writes of it in Between the World and Me—the way fear is embodied in the generations. But here, in Fade to Black, we register fully a life seen close up. In the world of film there is the alteration and erasure of the African American, until now never come fully into the light. Teri Cross Davis takes us headlong into this denial and now gives full credence to ownership— ‘a mirror, and I discover me/ learning how slow love is, ever slower/ acceptance, but traveling down the only road I want to know.’ A powerful opening to this collection of poems. A deep intelligence governs this work and a struggle to look squarely at a culture—peoples of many cultures in actuality—intentionally wiped clean of its history. I consider the strangeness of this when I stand at the edge of a massacre pit in a village where many of my own family lived, that part of my history that can never be known to me. What must it feel like when an African American makes that first journey back to Africa, to Nairobi, Kenya, as Teri Cross Davis did, learning Swahili, crossing the immense distance in time, to attempt to fill in what is missing. Simon Schama wrote once that we must study history not only through the texts but through the archives of our feet. I have never understood why the shade of our skin should have any bearing on how we envision one another. My own DNA tells me that I originated in East Africa. In more than one poem we come to what Sterling Brown called ‘folk speech’: ‘not limited but capable of tragedy, irony, the blues, pithy, epigrammatic, hitting a straight lid with a crooked stick’ according to Zora Neale Hurston. Sterling says he learned the arts and sciences at Williams and Harvard, ‘but I learned the humanities at Virginia Seminary.’ What I hear in this language are the remnants of African languages as they evolved over a long time and melded with various forms of English and were then invented anew, but somehow kept their identity. Plainer to see in places like the Georgia Sea Islands and other more isolated places. Consciousness of difference follows the child all her growing up days and is experienced in various ways for those in segregated communities vs. integrated communities. With the coming of puberty, the poems trace a life as it comes into its fullness and its awareness. Dear Diary, is a poem in full dialect—the tale of a girl’s pregnancy, giving birth, the death of the baby at the hand of its father and the girl’s primary concern about what she’ll tell her schoolmates. In other work we find a child who ends up taking responsibility for the behavior of adults, yet proves helpless to do so. These penetrating themes and the courage to let them be shown, as in Scar Tissue: A Bop, are reminders of the cost In Akron at Night mother and daughter take an unknown path, their small adventure together, building something new. Teri Cross Davis tells the hard stories straight, as when in Laps the narrator’s brother’s wheelchair rolls down a driveway out of control. ‘I see the curved black tongue/ of the driveway, its mouth opening to the residential street The eagerness/ to spill my brother into some red Taurus’ unsuspecting bumper...’. We are here for the long haul, for the journey, which we willingly take. Yet later, fulfillment does come into this life. Our narrator makes claim to love (Morning Ritual Hair) and holds off time’s relentless journey. We see the deepest empathy for the other: ‘I wish for snow. To bury your hurt clean,’ (Work Calendar) on the death of her partner's father. Teri Ellen Cross Davis is a Cave Canem fellow and has attended the Soul Mountain Writer’s Retreat, the Virginia Center for Creative Arts, and the Fine Arts Work Center in Provincetown. Her work has been published in many anthologies including, Bum Rush The Page: A Def Poetry Jam, Gathering Ground: A Reader Celebrating Cave Canem’s First Decade, Growing Up Girl, Full Moon on K Street: Poems About Washington, DC, and Check the Rhyme: An Anthology of Female Poets & Emcees. Her work can also be read in the following publications: Beltway Poetry Quarterly, Gargoyle, Natural Bridge, The Sligo Journal, ArLiJo, Mi Poesias, Torch, Poet Lore and is forthcoming in the North American Review and the Puerto Del Sol blog. She currently lives in Silver Spring, MD with her husband, poet Hayes Davis and their two children.